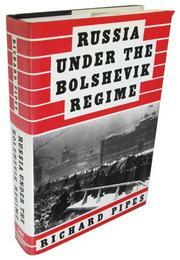  In the third volume of his magisterial trilogy, Pipes (History/Harvard), author of The Russian Revolution (1990) and Russia under the Old Regime (1975) completes the story from the Bolshevik takeover in 1918 to the death of Lenin in 1924. Pipes, toward the end of his research, had access to the Central Party Archive in Moscow, and he not only gives the fruits of a lifetime of professional involvement with Russia, but also makes some startling revisions to a subject encrusted with propaganda, disinformation, suppression, and diplomatic reticence. He argues, for example, that the Civil War, far from being forced on the Bolsheviks, was part of their program; that the White Russians never intended the restoration of tsarist autocracy; that virtually the entire intelligentsia, both professional and creative, rejected the Bolshevik dictatorship; that in 1920-21, ``except for its own cadres, the Bolshevik regime had the whole country against it, and even the cadres were rebelling''; and that the 1921 famine in Russia, news of which was minimized by New York Times correspondent Walter Duranty and glossed over in a single paragraph by E.H. Carr in his massive history of the period, was ``the greatest human disaster in European history until then, other than caused by war, since the Black Death.'' The surprising thing, Pipes notes, ``is not that [the Bolsheviks] won the Civil War, but that it took them three years to do it.'' They survived by ``a combination of repression, enforced with unrestrained brutality, and concessions embodied in the New Economic Policy.'' By the time of Lenin's death, Pipes says, every ingredient of Stalin's rule was present except for the murdering of fellow Communists. This book--with the light it casts not only on the major events of the period but also on neglected subjects like culture and religion (the Central Archive shows that Lenin asked for daily reports concerning the number of priests shot)--will give rise to controversy, but it is a monumental achievement, unlikely to be surpassed for many years to come. 75 black and white illustrations- -not seen.